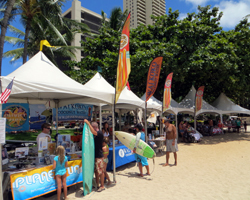 Duke’s Oceanfest: Nine Days of Hawaii Beach and Ocean Sports. 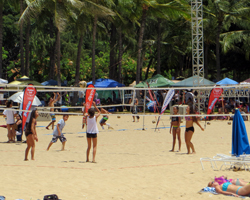 Duke's Oceanfest: Nine Days of Hawaii Beach Sports! In some ways, Duke’s Oceanfest is the ideal Waikiki Beach spectator sporting event; and in other ways, it’s not as spectator-friendly as you might like. 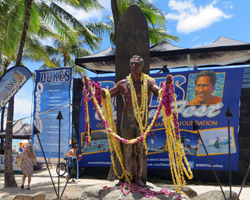 Named after Duke Kahanamoku – the world-famous gold medal swimmer, surfer and actor from Hawaii, who’s widely regarded to be the greatest waterman ever – this nine-day event is held in conjunction with Duke’s birthday (August 24). And every day is absolutely packed from morning to evening with surfing competitions, water races/games, and beach sports! These events are great for the average beachgoer to watch because they’re value added to an already good time! If you’re out enjoying Waikiki Beach, not only do you get the sun, sand, and surf, but during Duke’s Oceanfest, you also get free entertainment to enhance your experience. You’ll see live sporting events that you’d probably never get to witness back at home; and you can watch from just about anywhere – the sand, the shade, the water… wherever you want. Stay as long or little as you choose. Or just ignore the sports going on around you and continue to have fun at the beach, which remains open to non-participants throughout the entire event. A few factors, however, make this event less than ideal for the average Hawaii visitor. For one thing, some of the events (such as open water races) really can’t be watched from the beach – except, maybe, at the start/finish. Another reason is that the surf contests are all at the mercy of the water conditions. If the waves are flat, there may be no contest, and all you’ll witness is a holding period for the competition. This is true of all surf contests, not just this one; but my point is that you don’t want to waste your whole day waiting. Finally, if you’re here with your kids, they’re probably going to be more interested in the beach than in the beach sports, which means your attention must go elsewhere. In short, I wouldn’t plan an entire Hawaii vacation around being able to attend this event (unless you’re planning to be one of the competitors). 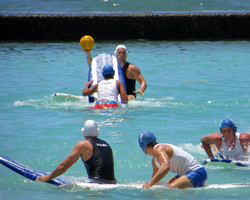 But as a value-added Hawaii activity I would gladly watch one or two events between my swimming and surf lessons. Personally, I liked watching the sand soccer and surfboard water polo. I’ve played both of these sports the normal way, and I thought it was fun to see them done with a Hawaiian twist. 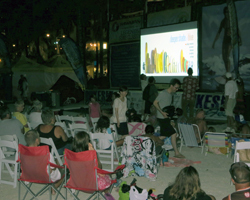 I also really enjoyed seeing a surf movie on the beach, because this genre of film is always more fun with a crowd of people hooting and hollering! To see a complete schedule of events or to obtain a competitor registration form, visit the Duke’s Oceanfest official site (opens a new window/tab). 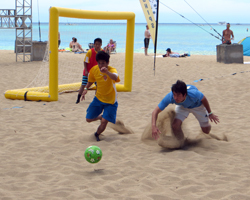 The sand soccer and beach volleyball are held on the beach directly across the street from the Honolulu Zoo. 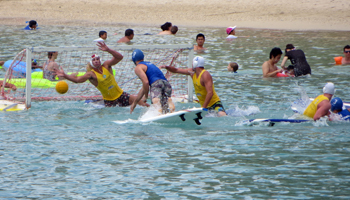 Meanwhile, the surfboard water polo is held inside the break-wall at Kuhio Beach. Most other events are held on the sand or in the water in front of the Duke Kahanamoku statue, which is also on Kuhio Beach. So if you’re looking for fun and free things to do in Waikiki, Duke’s Oceanfest could be exactly the excitement you need to make your good vacation great!